A biography of Ronnie Lane is well-overdue. Aside from writing many memorable songs, Ronnie was quite unlike anybody else in the music business. He loved his music and he wanted success but he strove for much more and it was not about making money - even though it would have been good had it received the royalties due to him during his lifetime. Can You Show Me a Dream? takes a long look at Ronnie Lane's life from his early years to his final years when he was dying of MS in Trinidad, Colorado. 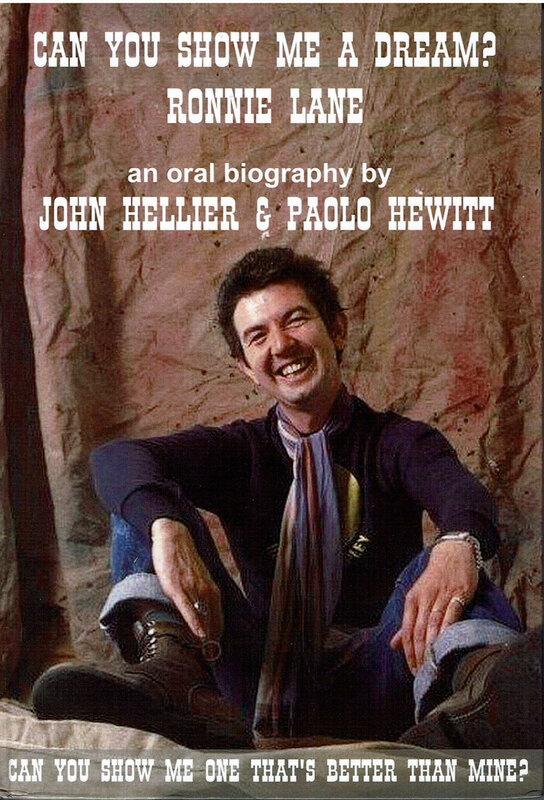 John Hellier and Paolo Hewitt previously wrote a biography of Lane's former bandmate and writing partner Steve Marriott. However, this "oral" biography takes a different approach. The book uses interviews with those who were part of Ronnie Lane's life and many of these were conducted for Darling of Wapping Wharf Launderette. The authors were able to access the vast archive of Ronnie's older brother Stan Lane who also supplied many photographs. Ronnie's life can be divided into four phases: the early years, the Small Faces, the Faces and the later years including Slim Chance. The two middle periods are probably the best known and this is what makes the earlier and later years more interesting. We knew Ian McLagan had been a member of the Muleskinners but did you know that Lane was also in the Muleskinners, an East End Muleskinners as opposed to Mac's West London Muleskinners. Those who were around at the time tell stories about how Lane met Kenney Jones and later teamed up with former child actor Steve Marriott and formed the Small Faces. Marriott's volatile nature was already evident at this stage. He joined Lane and Jones' band the Outcasts on stage and promptly demolished the piano and earning a ban for the band that we was not even a member of. Cue the start of the Small Faces when they found guitarist Jimmy Winston (Langwith). He was persuaded to switch to keyboards so Marriott could play guitar. Besides his parents owned a pub where they could rehearse (the Ruskin Arms) and his brother had a van. Like many other songwriting partnerships the team of Marriott and Lane was essentially two separate writers who would often finish off each other's songs. Itchycoo Park, for instance, is a Ronnie Lane song finished off by Marriott adding the line about ducks. By this time Lane was becoming more spiritual and had been introduced to the teachings of Meher Baba by Pete Townshend of the Who. From this point there is a definite change in Lane's songwriting, becoming more laid back and looking for deeper meaning. Listen to early Immediate tracks such as Show Me the Way and Green Circles. Ronnie Lane is also credited as the driving force behind the wonderful Ogden's Nut Gone Flake. At the same time, Marriott was moving in a different direction and his ego was taking over. When Marriott left the band to form Humble Pie, the others felt let down and looked for a new direction. After a brief phase the remaining Small Faces recruited Ronnie Wood and his brother Art as well as Kim Gardner from the Birds and Rod Stewart as vocalist and performed as Quiet Melon. Soon afterwards, the Faces were launched. This was Lane's second great phase and where they strove to be very different to the Small Faces. With Ronnie Wood and Rod Stewart from the Jeff Beck Group you had the merger of two major 1960s bands to create one of the 1970s great acts. Ronnie Lane wrote some great songs during this time including the evolution song Stone and Debris about growing up on east London bomb sites. Ooh La La was a classic Lane track although Rod refused to sing it at the time and Wood took lead vocals. Stewart later resurrected the track for one of his solo albums. However, despite the success of the Faces, Ronnie Lane was becoming disillusioned. He had been in one group where the lead singer was taking over the band and now Rod Stewart's successful solo career was turning the Faces into his backing band. This was all too much and Ronnie quit. The Faces did not long afterwards. Even Stewart acknowledged that Lane had been the beating heart of the Faces. However, at the time Ronnie Lane was certainly not Rod Stewart's biggest fan. The next stage of Ronnie Lane's career could be seen as an unexpected direction. He wanted to do something different and that meant buying a farm on the English/Welsh borders and opting for a completely different way of life. He had a dual occupation as musician and farmer. He brought together different musicians who typically lived around the farm in caravans and they could make music outdoors all day and all night. The memories of those musicians make great reading. It was evidently a very happy place and some great music came out of the farm in the form of Ronnie Lane & Slim Chance LPs. However, the country folk nature of music of the music was a far cry from Ronnie's earlier work. One area that was highly successful was the LMS, Lane's Mobile Studio. This mobile recording studio was not only used to record Ronnie Lane but was sought after by the great and the good as it was such high quality. Hiring out the LMS brought income into the farm. Many other musicians visited the farm and joined in with the jamming sessions. An evening down the local pub could see Ronnie Lane and Eric Clapton jamming in the corner! A collaboration with Pete Townshend, Rough Mix, helped with the finances but it was still relatively unsuccessful compared with the Faces and the Small Faces. Then came the next stage of Ronnie Lane's plan. He considered himself to be something of a gypsy. The idea was to make a show on the move called The Passing Show. It toured the country like a circus with music (Ronnie Lane & Slim Chance) as well as circus-type acts. However, it may have been an interesting and innovative idea but it was a commercial failure. The vehicles were past their use-by date and kept breaking down and the organisation was poor. Lane was left penniless. After The Passing Show Lane moved to the US, partially due to his desire for better treatment for his MS which, by now, was fairly advanced. He lived in Houston and Austin and managed to become part of the local music scene even if he did need to be carried onto stage sometimes. In the UK he had helped to set up ARMS (Action for Research into Multiple Sclerosis) which had staged a very successful concert with funds going to help MS research. There was an attempt to replicate this in the US with many of Lane's "showbiz" friends keen to help out. However, this ended up as a disaster and, while Lane was absolved of all responsibility, funds appeared to "disappear". Lane then met his third wife Susan. They moved to Colorado where Ronnie could live out his days breathing fresh mountain air. He was still receiving treatment and his bills were partially paid by Rod Stewart and Jimmy Page. This is a fascinating book even if some parts are already quite well-known. What is clear is that Ronnie Lane was held in very high esteem by his fellow musicians not just for his ability but also as a person. If you have not checked out Ronnie's work after the Small Faces and the Faces then this will encourage you to do so.